How long before all the internet jokes about the invincible toughness of action movie veteran Chuck Norris have Liam Neeson’s name attached? The actor, who has been Oscar and BAFTA nominated for his dramatic roles seems has taken a whole new lease on his career by starring in high-grossing boom-crash operas like Taken and Unknown. 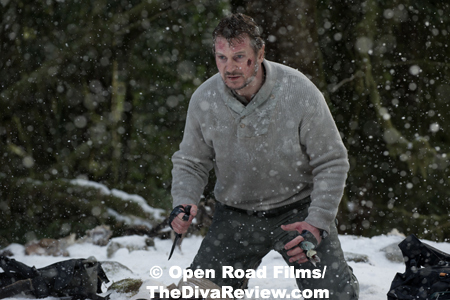 The unlikely action hero turns in another testosterone-driven performance as a man battling a nightmare in the wild in The Grey. 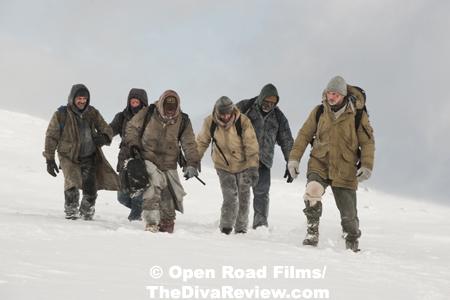 It’s back to civilisation for a group of oil rig workers in nippy Alaska. An airplane full of hard-berled fellows makes its way through the falling snow with a few bumps at first before sparks fly in the cockpit and the fuselage peels away like a banana and the plane splits apart, hitting the ground at top speed. 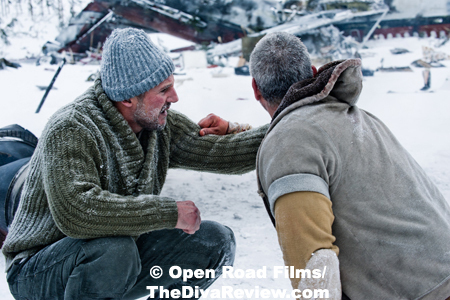 Ottway comes to in the midst of gusting, snow-filled winds and begins a rescue effort to save other survivors; some men he’ll find mostly intact, others are only torsos still glued to their seats. There are only very few left alive in varying states of health and many more deceased. Despite some foolish, macho chest-beating by others too freaked out by their circumstance to make sense, Ottway’s clear thinking in the midst of the crisis has him leading the group. That leadership is essential once their makeshift shelter in the plane’s hull is discovered by some visitors. The glowing eyes, dripping jaws and fur standing on edge in attack posture is the first clue that the wolves don’t appreciate this surprise party dropped out of the sky. Luckily for the group, Ottway turns out to be an experienced wolf killer hired by the oil company. Unfortunately, the predatory behaviour the Lupi exhibit isn’t particularly predictable and may reflect how near the men are to the wolves’ den, an area they cannot determine in all the snow. Unfortunate thing number two is the fact that Ottway’s wolf-blasting rifle didn’t make it through the crash and he only has a handful of shotgun shells, a thermos full of plane fuel and a fading Zippo lighter comprising his arsenal. After the wolves brutally mark the crash site as their territory, Ottway’s team is running (trudging? schlepping?) blind through the waist-deep snow with no clue where to go, trying to find shelter and steer clear of the stalking animals. Their attempted escape doesn’t stop the wolves from asserting their dominance by strategically picking off the men one by one with military precision. Between their toothy pursuers and the horrific blizzard conditions surrounding them, Ottway wonders if he can keep the survivors and himself alive long enough to find rescue. There are few movie stars as effortlessly alpha as Liam Neeson, with his tall, imposing stature, commanding, manly-man presence and deep, booming voice. What puts Neeson in a different class than most of the denizens and dilettantes of the action world are his remarkable acting chops. Tell me he happens to be a wolf hunter for hire after coincidentally crashing into the middle of a cranky pack of puppies, I’ll believe it. Show me his incredible nature-surviving skills so much on par with a certain resourceful TV hero that another character calls out MacGyver, I’m with it. Sell me the guy suffering with personal heartache and questioning every belief he ever had in the midst of this nightmare and Neeson seals it. All of this occurs during The Grey and part of its success is that the audience not only believes everything Neeson says onscreen, but they feel for him and root for the character. If I was caught in some horrible disaster during a relentless blizzard and being stalked by some xenophobic wolves, I’d pick Liam Neeson to get me out of there. The other characters are more one-dimensional, though well acted: You have the smart-aleck who practically has a neon “Puppy Chow” sign over his head from the moment he opens his mouth. There is the earnest youngster whose optimism gives Ottway hope to keep calm and carry on. There’s the tough guy who challenges Ottway at every turn, pulling some poorly-timed alpha-male stunts as the wolves are watching, even though the closest he’s been to nature is watching the National Geographic channel. The actors invest in their characters enough for the audience to care what happens to them. 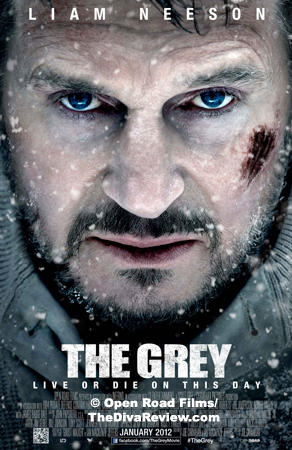 The pacing of The Grey is fantastic: Director Joe Carnahan balances his cast’s performances with real pulse-pounding action and genuine spooks. When we see the first set of luminescent wolf’s eyes, shining in the darkness extremely close to the crash site, it is joined one by one by many more eerily glowing, seemingly disembodied pairs. Carnahan creates a palpable fear by making nature itself the real adversary: The animals, a hypnotic mixture of beauty and terror, are only being what they should be, and the men of the civilised world have no barometer for this. Even Ottway’s survivalist efforts aren’t guaranteed. Regardless of how they came to be there, these men have invaded the wolves’ territory in the freezing cold of a blizzard, so it’s not like we’re dealing with supernatural creatures, which is even more frightening. 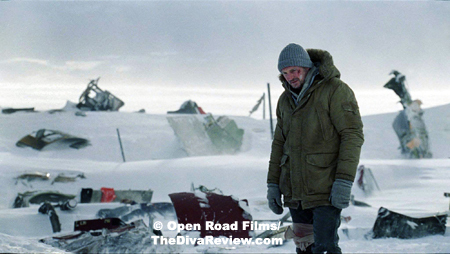 The only time Carnahan puts a foot on the brake in The Grey is to give you small moments of the men either fighting or bonding as they try to save themselves. My loathing of gratuitous shakycam is well-documented, so much so that I give an “award” for it every year, but Carnahan gets it right; first, by not abusing it, and second, by employing it to truly put the viewer in the experience. The plane crash is quick and shocking. The men’s lateral vault from high mountain cliffs into the safety of the tall trees will have viewers’ hearts in their throats and an unscheduled trip downriver will put them on the edge of their seats. I was awfully glad the movie wasn’t in 3D because I don’t think I could’ve taken it. 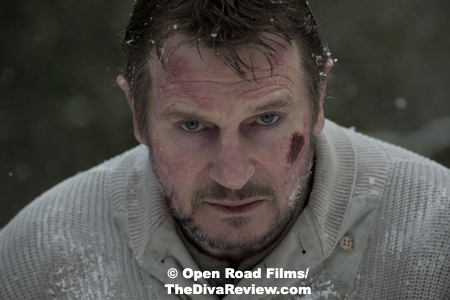 Good stuff and a lot of fun The Grey is and definitely worth seeing in a theatre with a giant tub of popcorn and a packed house all pumped to praise the new great action star, Liam Neeson.